Seattle Kokon Taiko (SKT), Washington's first performing taiko ensemble, invites you to help us celebrate our 35th anniversary of powerful Japanese drumming at RHYTHM, MOVEMENT, & SPIRIT, a concert synthesizing the three core elements of taiko. 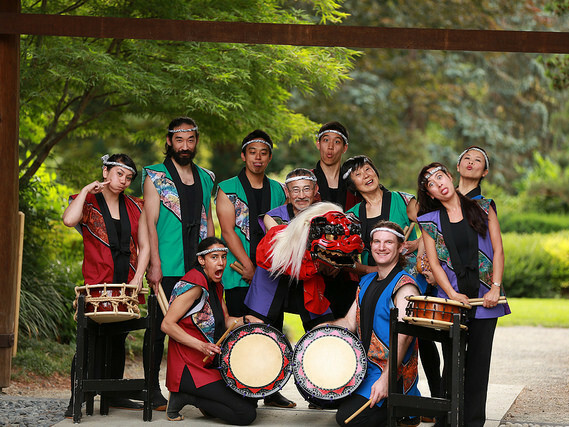 SKT, founded in 1980, strives to combine the ancient roots of taiko — based in Japanese drumming, folk dance, vocalization, and bamboo flute — with the modern Japanese American kumi-daiko (group drumming) style. By embracing taiko’s traditional origins while adding the innovative and creative energy of contemporary culture, SKT creates a powerful, unique, and fun style that we have shared with audiences of all ages over the last 35 years. Through taiko, we hope to contribute to the development of a uniquely Japanese American art form — Japanese in origin, American in expression — that weaves threads of continuity between generations and builds bridges of understanding among people of all nationalities and walks of life. Your contribution, however great or small, will help with venue rental, production costs, guest artists, transportation and lodging, as well as costuming and equipment repairs. In short, your help will allow us to create a more wonderful and magical experience for all to enjoy! Learn more about SKT here . We are into the last month of fund raising before the big event - and we are still out there performing! Tomorrow is Japan Fair in Bellevue at the Meydenbauer Center and SKT will be performing at 1:30pm. Come and see us after our performance for a concert flyer with a special discount code ($3 off adult general admission to our concert) just for Japan Fair visitors! The code is good through Labor Day, so don't miss out. Thanks to all of you, we're continuing to make progress towards our GoFundMe goal, and we're happy to say that VIP and General Admission tickets are on sale to our October 1st concert at skt35.brownpapertickets.com! We're also holding a workshop on September 24th, so if you want to try your hand at a taiko drum, this is the perfect opportunity. Admission to the workshop is also available at skt35.brownpapertickets.com. 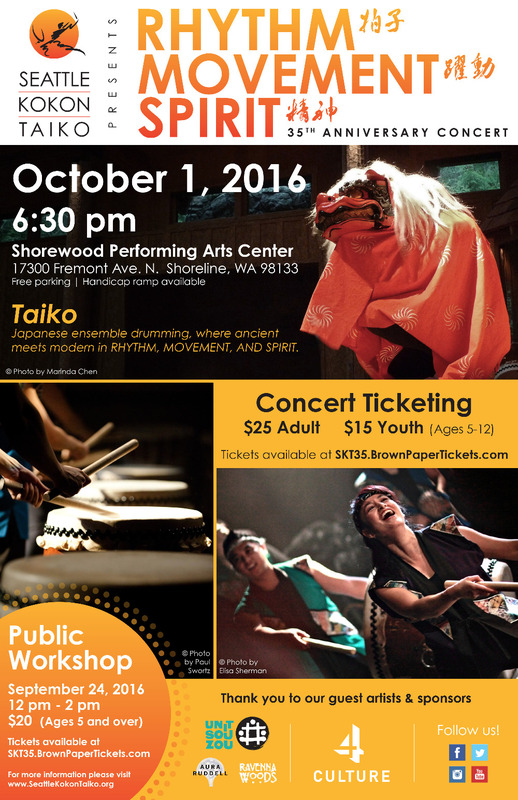 That's right - you can play taiko with SKT one Saturday and then watch our concert the next! 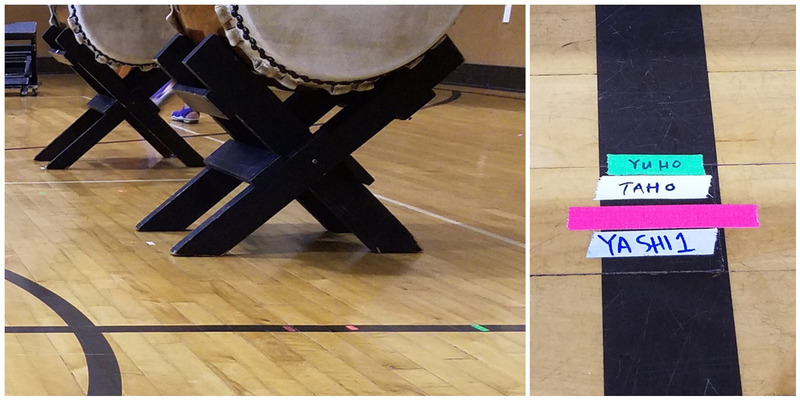 Have you ever seen one of our performances and noticed several pieces of brightly colored tape on the floor? You may have wondered, "Was the stage used for a blacklight party the night before?" Well, not as fun but just as interesting, that tape was actually put on stage by us prior to our set. In fact, it's called "spike tape," and we use it to mark the exact locations where our drums need to go for each song. Considering the precision required in our taiko performances, you can see why we need to be spot on with drum placement. At this past Sunday's practice, we spiked our entire concert and ran through all of the transitions. Check out all of the tape on the floor! Just like we practice each of our songs, we also practice our spiking. WE LIKE SPIKE! Spike tape is essential! It's been a week since our last update and we've had exciting news to share. Thanks to all of our supporters, we were able to pass the halfway mark on our goal and currently sit at close to 60%! In last week's Update 2, we gave you a sneak peak at our new happi that we're debuting at our concert. In this update, we're giving you a preview of our concert poster. We just received them from the printer last week, so if you're in the Puget Sound area, keep an eye out for them. Thank you again to everyone for your support! We are extremely fortunate to have Maria Dost making a very creative contribution in the form of the design and production of costumes for the show. Here's a glimpse of some of the great work she is doing. Congratulations SKT on teaching such an amazing milestone! From members of Unit Souzou & Korekara Taiko.